The prices in this deal round up were accurate as of 2019-03-20 07:28 EST. The prices may have changed since then. 52% OFF Pyrex Simply Store 6-Cup Rectangular Dish: You can get this for only $6.17 here and it’s normally $12.88 at Walmart. 65% OFF SYLVANIA SMART+ Expansion Lightstrips for Bluetooth and ZigBee Starter Kits, Warm White to Daylight, RGBW Color Changing and Dimmable Lightstrip: You can get this for only $9.61 here and it’s normally $27.99 at Amazon. 50% OFF BELLA (14538) 2.5 Liter Electric Hot Air Fryer with Removable Dishwasher Safe Basket, Black: You can get this for only $39.99 here and it’s normally $79.99 at Amazon. 50% OFF Dyson – Ball Animal Bagless Upright Vacuum – Iron/Purple: You can get this for only $249.99 here and it’s normally $499.99 at Best Buy. 76% OFF Elmer’s Liquid School Glue, Clear, Washable, 1 Gallon – Great for Making Slime: You can get this for only $9.99 here and it’s normally $42.84 at Amazon. 70% OFF GearWrench 1/4 in. and 3/8 in. Drive Mechanics Tool Set (143-Piece): You can get this for only $75.11 here and it’s normally $250.37 at Home Depot. 51% OFF Marvel Mighty Muggs Spider-Man #4: You can get this for only $4.88 here and it’s normally $9.99 at Walmart. 62% OFF Insignia – 10-Cup Coffee Maker – Stainless Steel: You can get this for only $29.99 here and it’s normally $79.99 at Best Buy. 49% OFF Summer’s Eve Simply Gentle Foaming Wash | Coconut Water | 5 Ounce | Pack of 1 | pH Balanced, Free from Harsh Chemicals and Dyes: You can get this for only $2.54 here and it’s normally $4.99 at Amazon. 50% OFF 50 Pro Accounting 2019 (1-User) – Windows: You can get this for only $176.49 here and it’s normally $352.99 at Best Buy. 54% OFF Mega Construx Call of Duty Care Package with Action Figure, Green: You can get this for only $6.99 here and it’s normally $15.20 at Walmart. 84% OFF Johnson Crappie Buster Spin’r Grub Fishing Bait: You can get this for only $2.49 here and it’s normally $15.97 at Walmart. 54% OFF Ozark Trail 12-Ounce Vacuum Insulated Can Cooler with Metal Gasket: You can get this for only $7.74 here and it’s normally $17.00 at Walmart. 45% OFF Hyperkin MegaRetroN HD Gaming Console for Genesis/ Mega Drive: You can get this for only $29.99 here and it’s normally $54.99 at Amazon. 43% OFF Insignia – 800 Lumen Rechargeable LED Flashlight – Black: You can get this for only $24.99 here and it’s normally $43.99 at Best Buy. 42% OFF Rohto Cool The Original Cooling Redness Relief Eye Drops, 0.4 Ounce, 3 Count: You can get this for only $12.00 here and it’s normally $20.97 at Amazon. 56% OFF Fosmon Xbox One/One X/One S Controller Charger, [Dual Slot] High Speed Docking/Charging Station with 2 x 1000mAh Rechargeable Battery Packs (Standard Compatible): You can get this for only $17.49 here and it’s normally $39.99 at Amazon. 44% OFF Ratcheting Screwdriver and Nut Driver, Multi-Bit, Cushion Grip Handle Klein Tools 32558: You can get this for only $12.09 here and it’s normally $21.65 at Amazon. 46% OFF Hyperkin Xbox Classic Pack for Xbox One X Collector’s Edition – Officially Licensed By Xbox: You can get this for only $47.99 here and it’s normally $89.99 at Amazon. 81% OFF Samsung SmartThings ADT Wireless Home Security Starter Kit with DIY Smart Alarm System Hub, Door and Window Sensors, and Motion Detector – Alexa Compatible (Zigbee, Z-Wave, IP Network Protocols): You can get this for only $99.99 here and it’s normally $549.99 at Amazon. 70% OFF Aropey Ultra Sharp Premium Heavy Duty Shears and Multi Purpose Scissors: You can get this for only $5.99 here and it’s normally $19.99 at Amazon. 68% OFF USB C Charger – EPICKA PD Charger with Power Delivery 3.0 and Dual Ports USB, Type C QC 3.0 USB Wall Charger AC Power Adapter for USA EU UK AUS, Compatible Laptops, Tablets and Smartphones (Rose Gold): You can get this for only $18.99 here and it’s normally $59.99 at Amazon. 65% OFF Tommy Hilfiger Mens Deer Valley Jacket, Created for Macy’s: You can get this for only $67.93 here and it’s normally $199.00 at Macys. 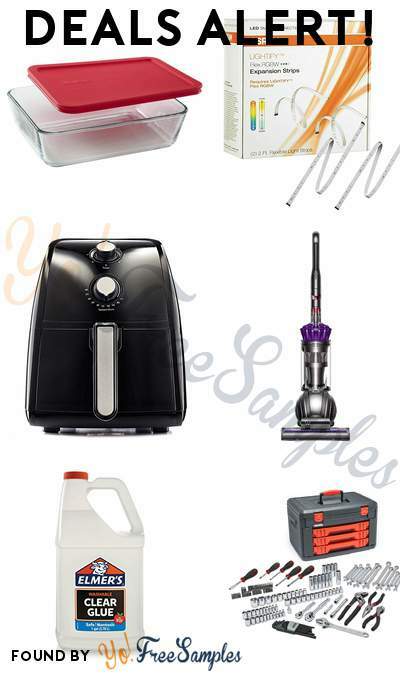 63% OFF INC International Concepts I.N.C. Men’s Italy Biker Jacket, Created for Macy’s: You can get this for only $28.93 here and it’s normally $79.50 at Macys. 99% OFF UNO Card Game: You can get this for only $0.01 here and it’s normally $5.99 at Amazon. 57% OFF FENGJIDA 9.5” Portable DVD Player with Headrest Mount Holder, Built-in Rechargeable Battery, 270°Swivel Screen, 5.9 ft Car Charger SD Card Slot and USB Port – Pink: You can get this for only $59.99 here and it’s normally $139.98 at Amazon. 83% OFF Sun Joe AJHN100-QC-2-BLU Aqua Joe One Touch Hose Nozzle w/Smart Throttle, 2PK, ((Colors Will Vary): You can get this for only $4.99 here and it’s normally $29.99 at Amazon. 49% OFF TACKLIFE 1/2-Inch Drive Master Shallow Impact Socket Set, Metric, CR-V, 6-Point, 17-Piece Set – HIS3A: You can get this for only $29.99 here and it’s normally $59.97 at Amazon. 60% OFF Sabrent USB Bluetooth 4.0 Micro Adapter for PC [v4.0 Class 2 with Low Energy Technology] (BT-UB40): You can get this for only $7.89 here and it’s normally $19.99 at Amazon. 55% OFF Fire Emblem Warriors – Nintendo Switch: You can get this for only $26.80 here and it’s normally $59.99 at Amazon. 55% OFF Sabrent USB 3.0 to SSD / 2.5-Inch SATA I/II/IIIHard Drive Adapter (EC-SSHD): You can get this for only $8.99 here and it’s normally $19.99 at Amazon. 48% OFF Transformers: Bumblebee Movie Toys, Power Charge Bumblebee Action Figure – Spinning Core, Lights and Sounds – Toys for Kids 6 and Up, 10.5-inch: You can get this for only $25.79 here and it’s normally $49.99 at Amazon. 50% OFF 3 Sprouts Play Mat Bag – Large Portable Floor Activity Rug for Baby Storage: You can get this for only $12.49 here and it’s normally $24.99 at Amazon. 70% OFF Essentials Racing Style Leather Gaming Chair – Ergonomic Swivel Computer, Office or Gaming Chair, Gray (ESS-3085-GRY): You can get this for only $68.11 here and it’s normally $232.00 at Amazon. 41% OFF Hyper Tough 6.0-Amp 1/2-Inch Corded Hammer Drill, DL1137: You can get this for only $17.63 here and it’s normally $29.99 at Walmart. 57% OFF Best Choice Products Outdoor Adirondack Wood Chair Foldable Patio Lawn Deck Garden Furniture: You can get this for only $51.99 here and it’s normally $121.99 at Walmart. 49% OFF Lenovo Tab E7, 7″ Android Tablet, Quad-Core Processor, 8GB Storage, Slate Black: You can get this for only $40.00 here and it’s normally $79.99 at Walmart. 83% OFF Charter Club Colorblocked Cable-Knit Sweater, Created for Macy’s: You can get this for only $9.96 here and it’s normally $59.50 at Macys. 70% OFF Lauren Ralph Lauren Lace-Up-Sleeve Sweater: You can get this for only $40.46 here and it’s normally $135.00 at Macys. 74% OFF 32 Degrees Men’s Venetian Faux-Suede Slippers: You can get this for only $9.96 here and it’s normally $39.50 at Macys. 46% OFF Freeman Pneumatic 18 and 20-Gauge Finishing Nailer and Staplers Combo Kit with Fasteners and Canvas Bag (3-Piece): You can get this for only $78.88 here and it’s normally $147.09 at Home Depot. 42% OFF Luminarc Stackable Assorted Clear Glass Bowls (Set of 10): You can get this for only $22.88 here and it’s normally $39.95 at Home Depot. 56% OFF Gorilla Ladders 47.25 in. x 12 in. x 20 in. Aluminum Slim-Fold Work Platform with 300 lbs. Load Capacity: You can get this for only $29.97 here and it’s normally $69.00 at Home Depot. 65% OFF Southern Enterprises Barnett Burnt Oak Open Bookcase: You can get this for only $121.35 here and it’s normally $346.72 at Home Depot. 41% OFF Milwaukee M18 18-Volt Lithium-Ion Cordless Combo Kit (6-Tool) W/ 3-Batteries, Charger and PACKOUT Rolling Tool Box: You can get this for only $499.00 here and it’s normally $849.00 at Home Depot. 46% OFF Men’s Columbia Smooth Spiral Hooded SoftShell Jacket: You can get this for only $69.99 here and it’s normally $130.00 at Kohls. 60% OFF Whitmor 112-Slot Ornament Storage Chest: You can get this for only $19.99 here and it’s normally $49.99 at Kohls. 60% OFF Disney / Pixar Finding Dory 18-in. Wheeled Carry-On by American Tourister: You can get this for only $31.99 here and it’s normally $79.99 at Kohls. 70% OFF Apt. 9 Meridian Women’s Knee-High Boots: You can get this for only $23.99 here and it’s normally $79.99 at Kohls. 50% OFF Men’s Nike Lightweight Breathe Hoodie: You can get this for only $22.50 here and it’s normally $45.00 at Kohls. 50% OFF Men’s FILA SPORT GOLF Driver Athletic-Fit Golf Pants: You can get this for only $29.99 here and it’s normally $60.00 at Kohls. 60% OFF Cuddl Duds Cozy Soft Throw: You can get this for only $19.99 here and it’s normally $49.99 at Kohls. 60% OFF Women’s Simply Vera Vera Wang Flocked Velvet Dress: You can get this for only $27.20 here and it’s normally $68.00 at Kohls. 80% OFF St. Nicholas Square Scroll Print Tablecloth: You can get this for only $5.19 here and it’s normally $25.99 at Kohls.